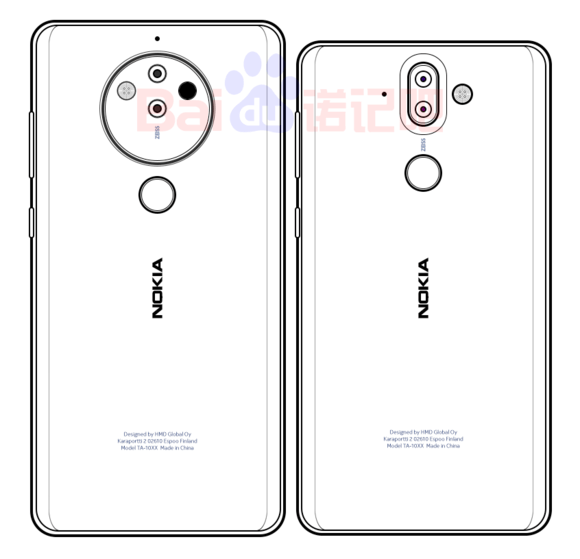 At the beginning of January this year, the teardown of the Nokia’s camera app revealed some upcoming smartphones including Nokia 7 Plus, Nokia 8 Sirocco, Nokia 9 etc. Recently, a new source has revealed the design of the Nokia 8 Pro, which is going to be a big upgrade from last year’s Nokia 8 which got a mixed response from the tech community. The phone is going to be a powerful device with impressive camera hardware. It is also said that the phone could be called the Nokia 10, but right now, the chances of the device to be called Nokia 8 Pro are more. As seen in the image above, the phone on the left is the ‘Nokia 8 Pro’ while the one on the right is the Nokia 9. The 8 Pro is expected to feature the Penta-lens setup along with the rotating zoom camera technology from Zeiss. Right now, we can only see a circular setup on the rear with two lenses, LED Flash and (probably) the Laser Autofocus. The ‘Zeiss’ branding on the camera module is a no surprise for sure. The source has also claimed that the phone is coming with an 18:9 display, curved glass on both the front & rear and a Snapdragon 845 processor under the hood. The launch might take place in Q3 or Q4 2018. There are still chances that Nokia will launch this phone with a different name in the markets. Stay Tuned for more details.